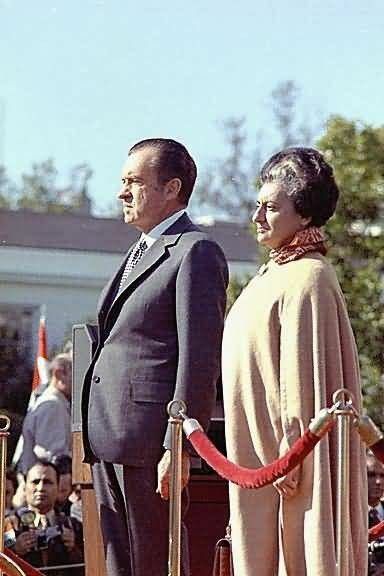 Indira Priyadarshini Gandhi (19 November 1917 - 31 October 1984) was the fourth Prime Minister of India, the first woman Prime Minister of India and central figure of the Indian National Congress party. Gandhi, who served from 1966 to 1977 and then again from 1980 until her assassination in 1984, is the second-longest-serving Prime Minister of India and the only woman to hold the office. Indira Gandhi was the only child of the first Indian Prime Minister, Jawaharlal Nehru. As the Prime Minister of India, Gandhi was known for her political ruthlessness and unprecedented centralisation of power. She went to war with Pakistan in support of the independence movement and war of independence in East Pakistan, which resulted in an Indian victory and the creation of Bangladesh. Gandhi also presided over a state of emergency from 1975 to 1977 during which she ruled by decree and made lasting changes to the constitution of India. She was killed in 1984 by her Sikh bodyguards a few months after she ordered the storming of the Sikh holy Temple in Amritsar to counter Punjab insurgency. She was also named “Woman of the Millennium” in a poll organised by the BBC in 1999.